his childhood vacation rolling around on the water. It is only due to my loathing of bureaucracy and the desire to explore that I was willing to embark on Colin’s long held desire to live a sailing adventure. Luckily he’s sly and I’m dim and he managed to shape our live until it seemed like it was my idea! It hasn't all been plain sailing, for very many reasons we have good days, bad days and near on impossible days. But by and large we've managed extremely well to live our lives 24/7 in a very small space, sometimes in pretty uncomfortable conditions. We have, eventually found our natural rhythm and forged on to find the reason we're out here; firstly the indigenous people and there culture and to embrace our world under the surface of the water. 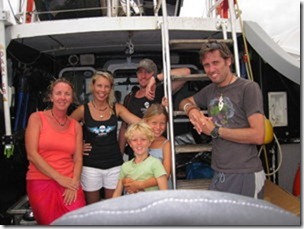 We loved the swimming and encounters with Turtles whilst in the Caribbean and spent a good deal of time snorkelling. I don't think I'd snorkelled since young childhood and certainly never in crystal clear water with an abundance of beautiful vibrant coral in all forms and colours. It was mind blowing and a moment of clarity as to where 'David Hicks' found his inspiration for his wonderful fabrics. The Children and I where initially rather tentative (read scared out of our swimming pants) about submerging ourselves, but the incredible array of coloured fish soon over came our trepidation. Next stop 'Gambier' and yet more shark infested waters. Only this time ‘no guilds’, this time the myth of the man eating properties of sharks got the better of us. So whilst we did enter the water, the sighting of the grey boys quickly had us enjoying the comfort of the sand once again. We have been particularly careful not to indoctrinate our children, we've seen too many young folk left too nervous to enter the water, mostly due to a learnt fear. Given the amounts of Sharks we encounter in the waters of Polynesia we have had to come to terms with our nosey neighbour. I know I have in every blog entry help to perpetuate the fear and convey to others the extra-ordinary bravery of us all! Have we ever been threatened? No. Have we ever had good reason to fear these Grey boys? No. Have we discovered these guys are nervous of us? Yes. Even times we've had an extra piece of bleeding fish and we've tied it to a bit of rope and waited to see what would happen. A bunch of white tips turned up in less than a minute. However it takes them near on a hour to build up the courage to get up close and personal. They are without a doubt super nervous folk. Days after arriving in Apia, Samoa we saw a rather strange Aluminium trimaran motorboat into the harbour. Colin inquisitive as ever approached one of the crew to ask more. This has been our big turning point. Oh and the facts we learnt. Firstly 'Sea Shepard, the 'renegade, lawless' organisation, perhaps where not quiet as evil as perhaps we might have initially been lead to believe. 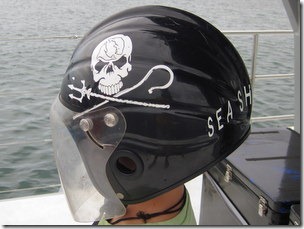 Whilst edgy they are only Conservation Organisation out in the water personally risking a lot and actually protecting sea life. It’s another classic media portrayal of something that is doing something that is not deemed to be normal so there for easy negative reporting fodder. 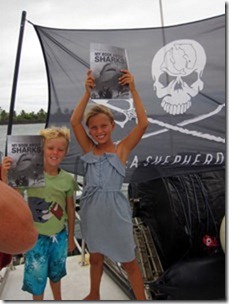 The Bridgette Bardot was in the South Pacific to try and educate the children and people about what was happening the worlds sharks population and to start a grass roots movement to save them. It’s thought that only about 10% of the original population is left and the depletion has largely happened in the last 30 years. Sharks have populated our planet longer than any other species, about 400 million years. Even the dinosaurs managed 230 million, which means they have survived over 5 mass extinctions. So we have to take it as red that they really are the founder members of our ocean and have shaped the whole eco system. Only 5 death from sharks happens world wide each year, perhaps we should be more frightened of cigarettes or double decker buses! Due to the recent boom with the Chinese Population we now have only 10% of our shark population left, the more rare the shark the bigger the price a fisherman gets for the fin. Fins give no taste to soup it’s only a thickening agent. But is prized by a population, deemed to show wealth, a very 21st Century obsession. The shark population is so much at risk from extinction and only 5%of the beast is used, not for taste or nourishment but for class distinction and thickener something a bit of arrow root would do without any loss of ocean eco system. Jaws – Peter Benchley and his wife spent a large proportion of there live trying to redress the myth his book and subsequent film did for the damage of the sharks reputation. Sharks are at the top of the very important eco system of our oceans with out these beasts the current exploitation of squid and jelly fish is set to continue which is perhaps a very bad thing for humans and the survival of other fish species. Whilst sharks have controlled many ocean species they will also suffer due to the current legislation to allow long lining fishing and other fishing methods that is leading to the deletion of fish stocks for the future human and oceanic generations. Everyone who love snorkelling/Diving, eating fish or just plain breathing must must must watch ‘Shark Water’ A Film made over 10 years ago but an education that every one needs to see. Google it now and do what ever you can to see it. It’s by the very lovely film-maker Rob Stewart. Bit of a banging on fact,But, did you know: Sharks have the highest brain to body mass ratio of all fish comparable to several mammals, sharks have been proven to learn through experience. A wonderful Brazilian journalist friend of ours was telling us about a bay near his home. The drainage system is not particularly modern in fact non existent, so the local abattoir blood would drain into the bay. This in turn excited the local shark population and got them so worked up they started to try and eat what was in the water, pretty normal behaviour me thinks, sadly it was people. This practice continues for almost a century. So the learnt behaviour of the shark population was that this bay was indeed the local restaurant, and who could blame them really. Amazingly the two bays a short distance either side of this bay have never experiences an attack. It is once again down to man who has created this situation. 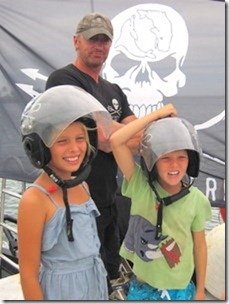 Sea Shepherd is an organisation of Eco-terrorists founded by Paul Watson (also a co-founder of Greenpeace) to take direct action against illegal whaling and fishing activities on the Oceans. 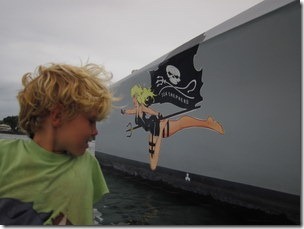 We saw their ‘fast attack boat’ the Bridgette Bardot in Apia harbour one day and not knowing anything about Sea Shepherd we went to investigate. 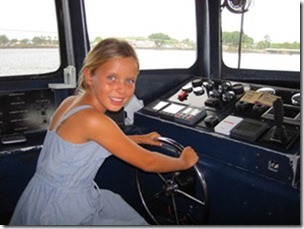 Lucky us we were invited aboard, and found out about ‘Shark Angels’ – the current campaign spearheaded by Julie Andersen to reverse the decimation of the world shark population. Why? you ask. Well, sharks are 400 million years old, and are the very top of the food chain, well they were, until we came along, made a film called Jaws and invented shark fin soup. Now near to 100 million sharks a year are killed for their fins, and 90% of the sharks are gone.